Fishing is always something I do with my dad. He taught me how to fish and now it's quality time we spend together. I was about 8 or 9 when he first took me fishing. I grew up on the south coast, so my first experience was sea fishing. We would often go to fish off the rocks or off the back of a dinghy and sometimes we’d explore the beaches as well. I must have enjoyed it because 20 years later I’m still fishing with my dad! I love that we make a day of it - we plan our trip, pack a picnic and spend the whole day together. I find it very relaxing and enjoy the peace and quiet, and the time I get to spend just with my dad. We are both very competitive though when it comes to fishing so sometimes we are focused on trying to beat each other. I fish in all weathers but I definitely prefer being out when the sun is shining. The enjoyment comes from the whole experience and a soggy picnic isn’t my favourite thing to eat! About 5 years ago dad introduced me to fly fishing. 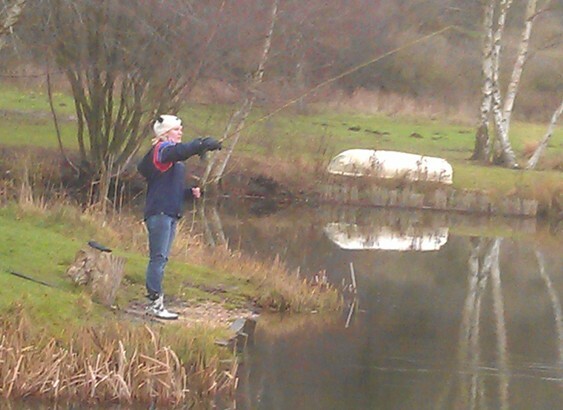 We went to John O Gaunts Fishery in Hampshire and there I landed my first trout. It was fantastic and is still my best catch. I had been trying all day to catch trout and I was getting really frustrated. Then the fishery gillie came to help, he gave me a couple of pointers and suggested I try a different spot – and then came success! Since then we have been fly fishing quite a few times. I love the challenge of fishing - the challenge of landing a catch and the challenge of beating dad - it’s all part of a good day. I think it’s a shame there are so few female anglers. I remember seeing some older women fishing when I first started, but I hardly ever see another woman. I really enjoy fishing and I think many other partners and daughters would too - it’s not just something for the boys. My message to other anglers is definitely take your family fishing! Share your passion for the sport and encourage more people to take part. A rod licence costs from just £27 a year, and anyone under 12 doesn’t need a licence. 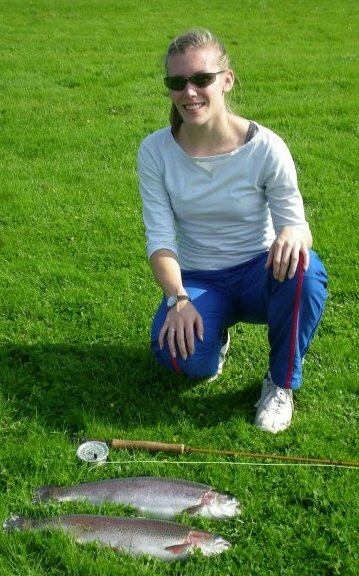 The money from rod licence sales is then used for a number of projects that support angling and fish populations. Dad shared his love of angling with me and even now, 20 years later I still want to go fishing with my Dad. So what are you waiting for, go fishing! For anyone inspired to try the sport, try FishingInfo.co.uk It’s the new website launched by the Angling Trust to provide information about where to fish, local tackle shops, coaches and clubs. I also started fishing at the age of eight, my first two years caught nothing yet, with my cheapy two part cane and a greenheart tipped rod, a small centre pin reel along with me kept hoping, that is until I saw a poacher fishing my best friends fathers water, I watched what he was doing and after that could almost catch river trout to order, so to speak. I am now 68 and have fished every way except wreck fishing! I hasten to add I am not Robson Green tehe! !